As a Medical Spa MD Member you can subscribe to any content on Medical Spa MD and have it sent directly to your email, ensuring that you don't miss anything you're interested in. Make sure that you subscribe to the main blog as well as this one so that you're aware of new updates to the site. Members may subscribe to any content and have it delivered to them via email. Click on your name in the top right corner of the page. 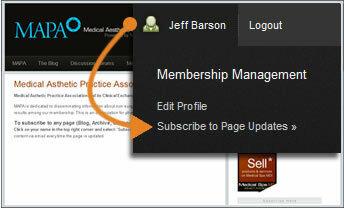 You will now receive updates to all the pages you subscribe to via email. You may subscribe to any page Medical Spa MD.